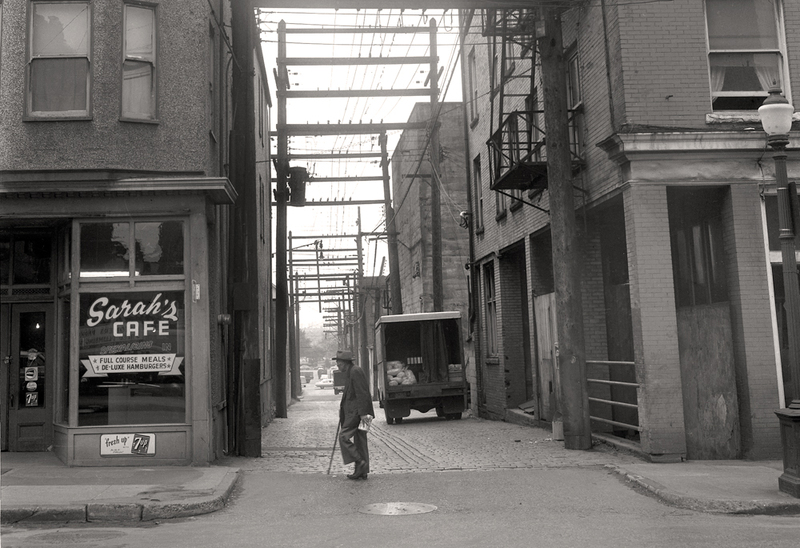 Sarah’s Cafe at 218 E. Georgia St in 1960. Photo: Franz Lindner, CBC Vancouver Still Photo Collection. In 2013, I wrote about this photo (above) that I found while working at the CBC Archives. It was one of a series of images shot by CBC Vancouver contract photographer, Franz Lindner, in 1960 as part of an assignment to illustrate a CBC Times (programming guide) feature for a radio documentary on drug addiction in Vancouver. 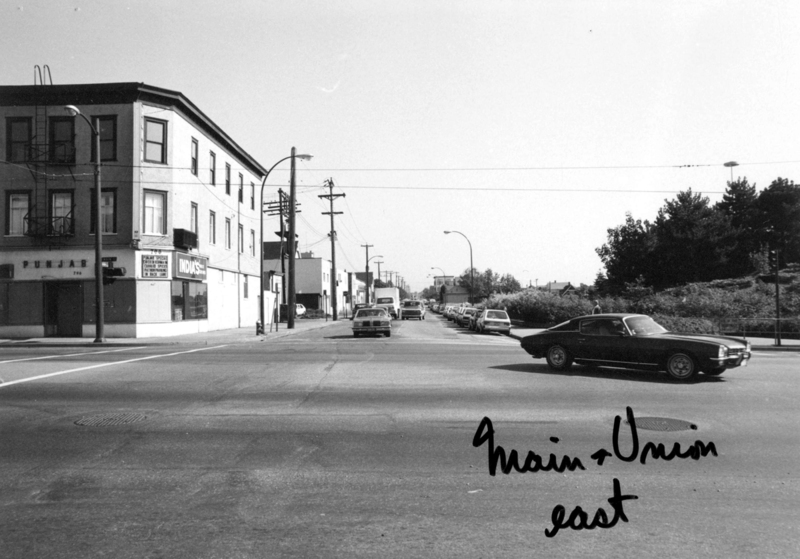 At that time, I focused my research on figuring out where this photo was taken (218 East Georgia Street) and if the building still existed (it does). This first pass at research/inquiry satisfied me at the time and I put the story on hold for a few years. However it was consistently on the back of mind and I was always keeping my eye out for and collecting any piece of information I could find on Sarah and her café in my research travels. I wanted to know who Sarah Cassell was and how did she, and her café, fit into the (hi)story of Vancouver. 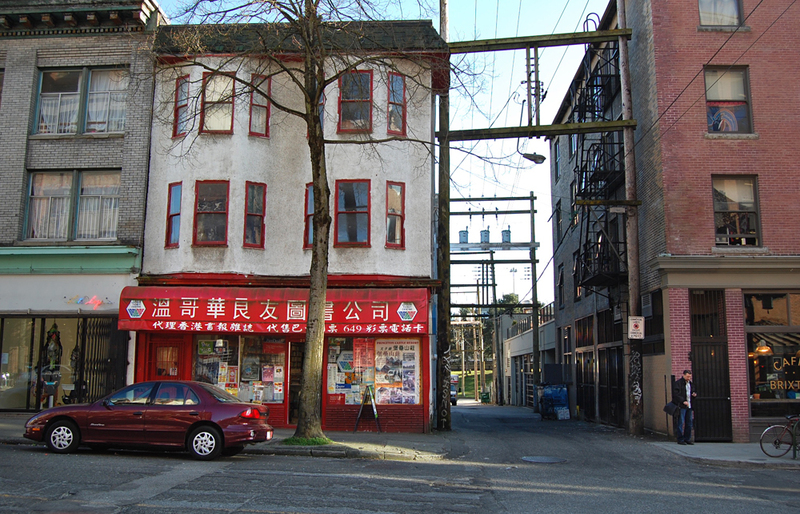 This historic area of the city (Hogan’s Alley/Strathcona/Chinatown) is full of tales of strong women who had their own businesses – Rosa Pryor, Viva Moore, Leona Risby, to name a few. Well here is the story of another one – Sarah Cassell. 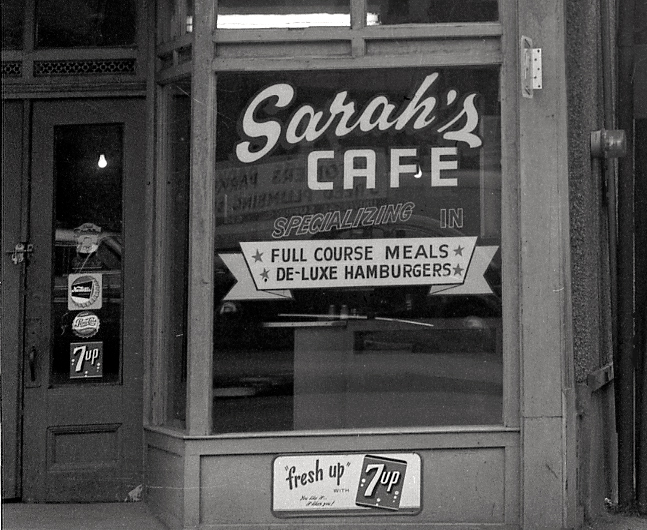 Sarah’s Cafe window at 218 E. Georgia in 1960. Photo: Franz Lindner, CBC Vancouver Still Photo Collection. Around 1957, Sarah’s Cafe opens at 218 E. Georgia, a 3-story wood frame building built in 1906. Mrs. Sarah Cassell is listed in the directory as the proprietor. She operates her café here – serving “full course meals & de-luxe hamburgers” until around 1962/63. However, this is not where Sarah Cassell’s story in Vancouver begins. It starts a few years earlier, around the corner at the Stratford Hotel. From the 1920s to the 1970s the Stratford Hotel (at the corner of Gore and Keefer) was a popular temporary home to loggers and other workingmen while they were in the city during the off-season. It should also be noted that for a period of time during the 20th C, the Stratford was one of only two hotels that admitted black guests in Vancouver. 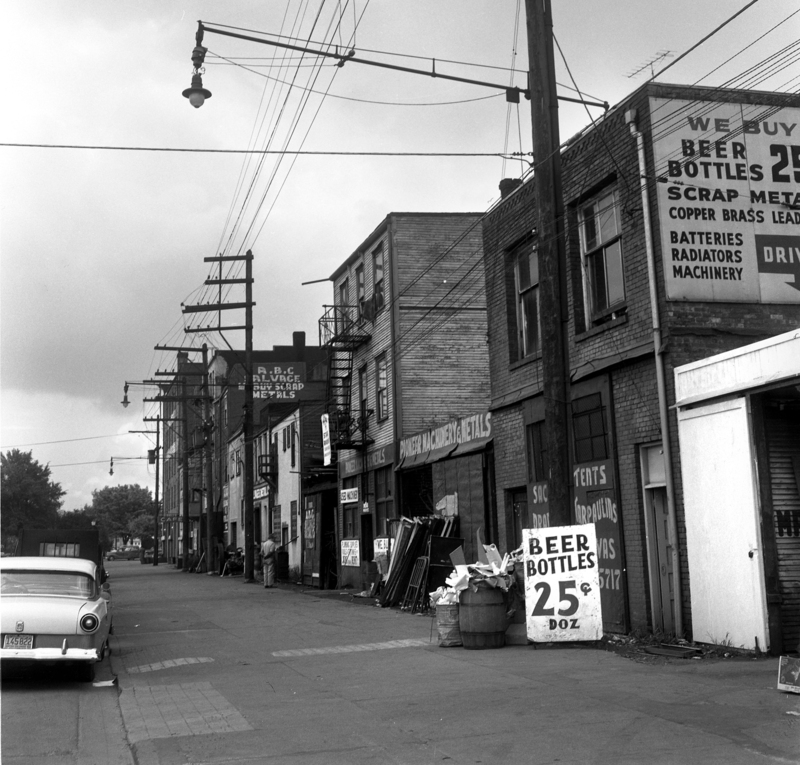 1969 photo of the 600 block of Gore Street. Showing a portion of the Stratford Hotel (right) and the cafe that used to be called the Stratford Grill. The Stratford was built in 1912. Photo: CoV Archives, CVA 780-333. The Stratford Grill was a street level (619 Gore) café that was part of the Stratford Hotel building; serving both hotel residents and the general public. According to the 1951 City Directory the proprietor of the Stratford Grill was James M. Cassell who resided at 1152 Richards. Sarah Cassell’s death certificate (via BC Archives Vital Statistics) lists James M. Cassell as her husband at the time of her death in 1989. What is intriguing, however, is that this is the only time that James Cassell appears in Vancouver directories, he seems to completely drop out of the picture (almost as quickly as he appeared). He does not appear to be living in Vancouver past 1951, nor prior to 1951 for that matter. James Cassell is also not mentioned in Sarah’s obituary in the Vancouver Sun. The following year, 1952, Mrs. Sarah Cassell is listed as the proprietor of the Stratford Grill and she stays as such until 1956 when she opens the self-named Sarah’s Cafe at 218 E Georgia. 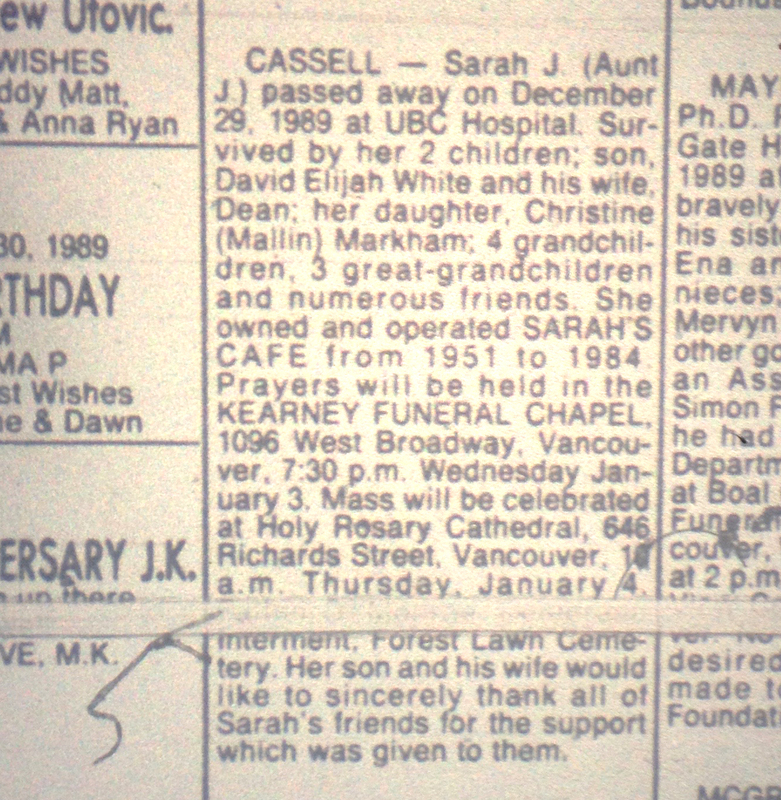 1989 Vancouver Sun obituary for Sarah Cassell. This obituary was the first time I saw any mention of Sarah’s daughter Christine. It is likely she did not live in Vancouver, or its environs. Sarah Cassell was born Sarah Jane White on January 10, 1910 in Tuitts village on the Caribbean island of Montserrat. How and where she spent the first 40 years of her life is not known. It is also not clear from the information I have gleaned so far, when exactly Sarah arrived in Vancouver. Sarah Cassell does not appear in the city directories prior to 1952. This, combined with the information about James Cassell from the 1951 city directory, suggests that Sarah Cassell did not arrive in Vancouver until about 1950. Her obituary states that she ran Sarah’s Café from 1951 to 1984. So it is likely she was running the Stratford Cafe along with James Cassell, and then took over the entire business after he left town for whatever reason. 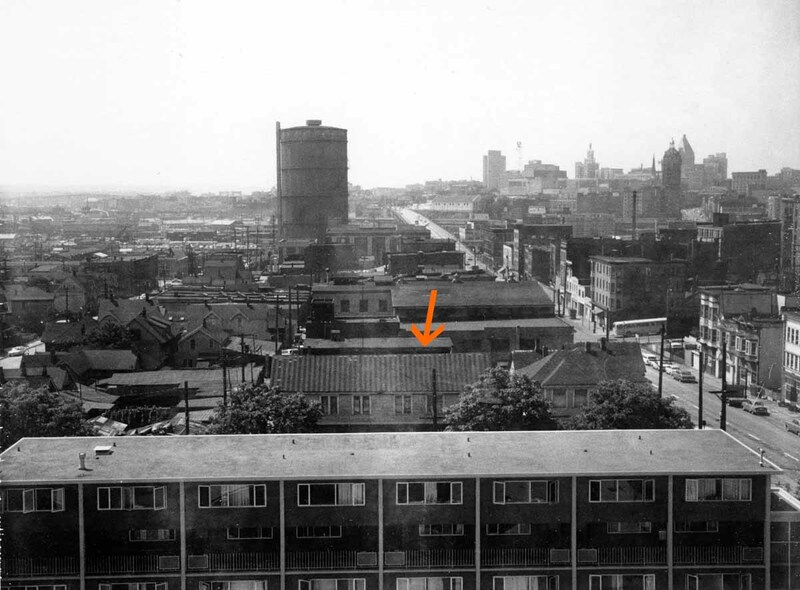 1962 photo taken from McLean Housing Tower (phase 1) looking west. Arrow points to location of Sarah Cassell’s home at 703 Dunlevy. Photo: CoV Archives , CVA 181-05. From 1951/52 to around 1961 Sarah Cassell is living in a row of houses at 703 Dunlevy St., right across the street from McLean Playground. Also living at 703 Dunlevy is David White a CPR Porter and Sarah Cassell’s son. Eventually this entire square block (along with 3 others) was demolished to make way for the MacLean Park housing complex forcing residents to find alternate housing. 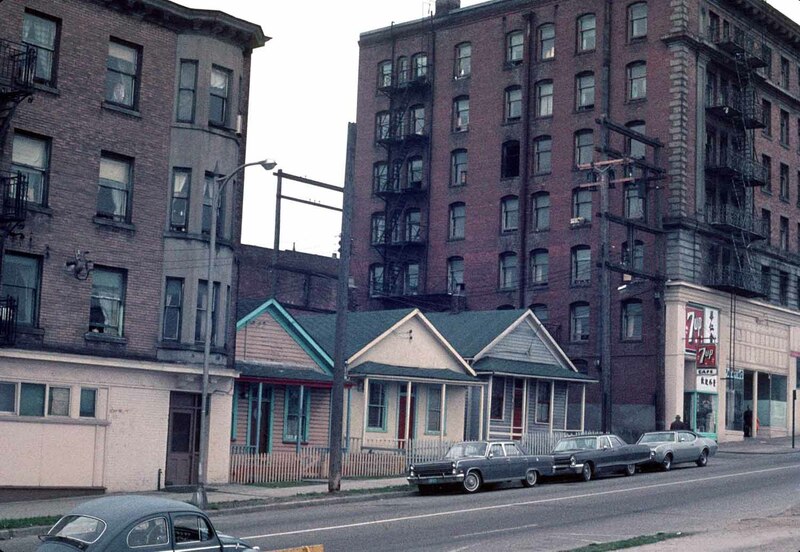 In the early 1960s (around 1962), Sarah Cassell and her son David move from their home on Dunlevy to 239 Union Street, directly above Valery’s Chicken & Steak House (241 Union). 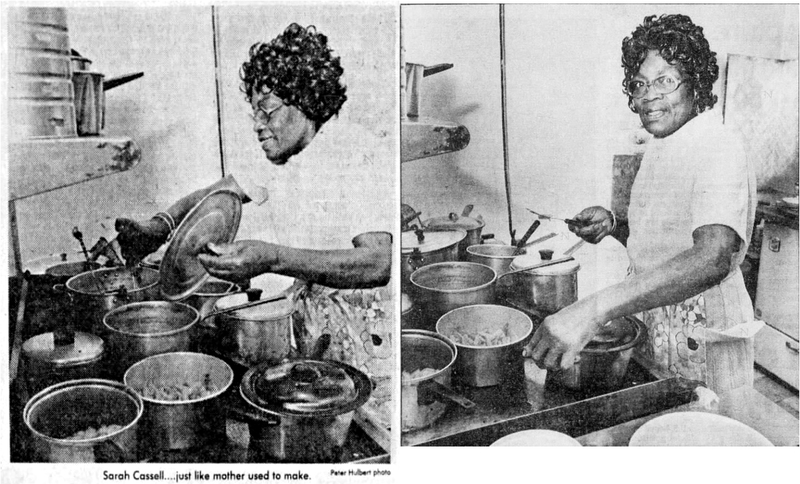 Ms. Cassell runs her cafe featured in the photo by Franz Lindner at 218 East Georgia for 7 years. 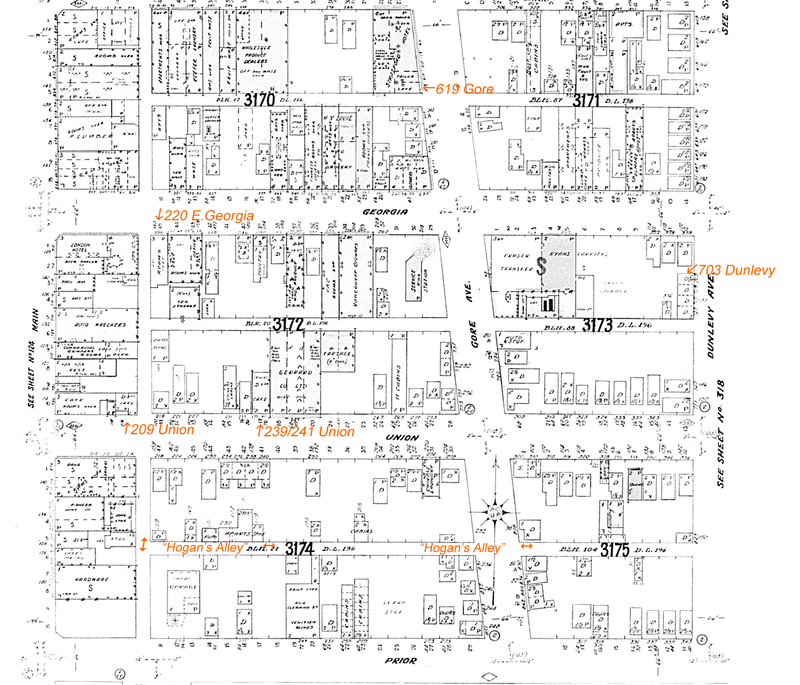 When the restaurant space below/beside her home becomes available around 1963, Sarah’s Cafe moves to 241 Union Street. Prior to that time, this location had been the home of Valery’s Chicken and Steak house for about 12 years run by a woman named Valery Nechia (yet another story!). Curiously, for the last year that Valery was running the restaurant at 241 Union, it was called Todd’s Café. According to the city directories by 1962 Valery Nechia was now a widow, living in Mount Pleasant and was now working as a dressmaker. 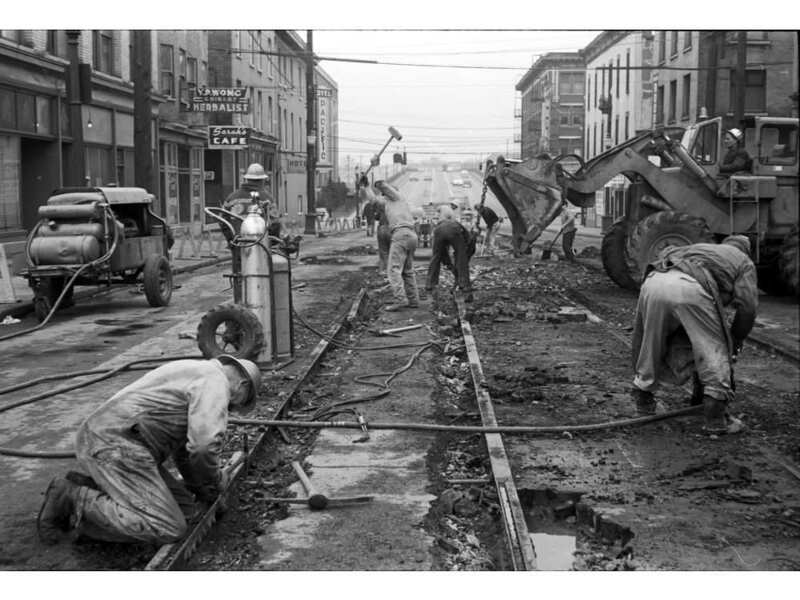 Detail of City of Vancouver photo from 1971 showing the 200 block Union St. and Sarah’s Cafe during the construction of the Viaduct. Photo: CoV Archives, CVA 216-1.23. For about 20 years, from 1963/64 until 1984, Sarah Cassell runs Sarah’s Cafe on Union Street and lives above. During much of this time Sarah’s son David is also living with her and working at Canada Post (and helping out at the restaurant on occasion according to some that frequented Sarah’s Cafe). Fire Insurance map ca. 1950s/1960s mapping out Sarah Cassell’s neighbourhood. Click on image to view. OK, enough of the tangible facts. I now knew how Sarah fit into her neighbouhood physically – living and working within a boundary of a few blocks starting in 1950. But what about the intangible facts? What was Sarah Cassell like as a person? What did she look like? And what was it like to eat at her restaurant? Surely, there would be more information out there? How does someone live and operate a restaurant in a neighbourhood for over 30 years and not leave an impact? Union St looking east at Main. Photo: CoV Archives, CVA 772-1093. Elwin told me that his first experience with western food was at Sarah’s Cafe, specifically he recalls he had his first taste of french fries at Sarah’s. Elwin said it was a really a treat eat at her cafe, as it was a big change from his mother’s Chinese home cooking. Elwin recalled that Sarah ran her cafe as a one-person operation, she took the orders and then went to the kitchen to prepare the food all to a soundtrack of county music (CKWX) playing on the radio. Elwin remembers Sarah as a kind woman in a wig (not uncommon for many women of that era to wear wigs of convenience) who would always ask after his mother. Elwin told me that Sarah would get her cafe linens laundered at Union Laundry. Often, Elwin was charged with picking up or dropping off laundry for Sarah’s Cafe. Even after his father’s laundry business was expropriated and torn down to make way for the Viaduct, he still had contact with Sarah. He assisted her during her move from Union Street to Bill Hennessey Place housing on Jackson St. in 1984. This is the same time that Sarah closed her cafe business at the age of 74, likely due to health reasons. I am sure Randy is right in saying that Sarah must have been greatly affected by the stress of seeing her neighbourhood being ripped apart (literally). Starting with the development of the McLean Park Housing development, through to the construction of the Viaduct. It takes a strong person to continue carrying on in the midst of chaos and division. And that is exactly what Sarah did, running her business though the 1970s and into the 1980s. 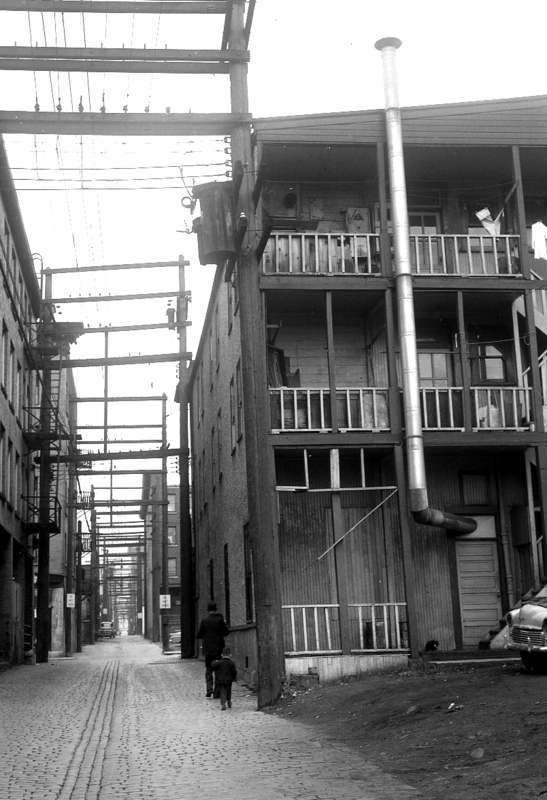 Rear of 218 E. Georgia in alley that ran north/south parallel to Main Street between E.Georgia and Union St. in 1960. Photo: Franz Lindner, CBC Vancouver Still Photo Collection. So far we can establish that Sarah Cassell was a kind and friendly woman, who worked hard, was independent, strong and resilient. She had two children and was not only a grandmother, but also a great grandmother with many friends. Her long-running cafe served the residents of this working-class neighbourhood and those that worked in the area during the day (perhaps even the construction workers building the viaduct across the street?). Since her business operated during the daytime, it didn’t attract the lively nighttime crowd that a place like Vie’s did. Therefore, there are no mythical tales of a young Jimmy Hendrix coming in for a burger and fries, or late night visits from visiting Jazz musicians. It just wasn’t that kind of place. Sarah’s Cafe was the place in the neighbourhood to get, as Randy Clark said, your “daytime fries” and simple cafe fare served with a smile. But that doesn’t mean Sarah’s story is less worthy of telling than any other story from the rich history of this neighbourhood. I am sure there are more stories and memories of Sarah and her cafe out there. I still have many more questions than I do answers. So if you have any memories or photos of Sarah Cassell or her cafe please let me know, I’d love to hear from you! 900 Block Station street (south of Prior St.) ca. 1960. Photo: Franz Lindner, CBC Vancouver Still Photo Collection. It’s funny how one thing leads to another (and another, and another…) You are researching one topic, and then you are led down a completely different path of discovery. I love that! It is exciting, but it can also be time consuming. 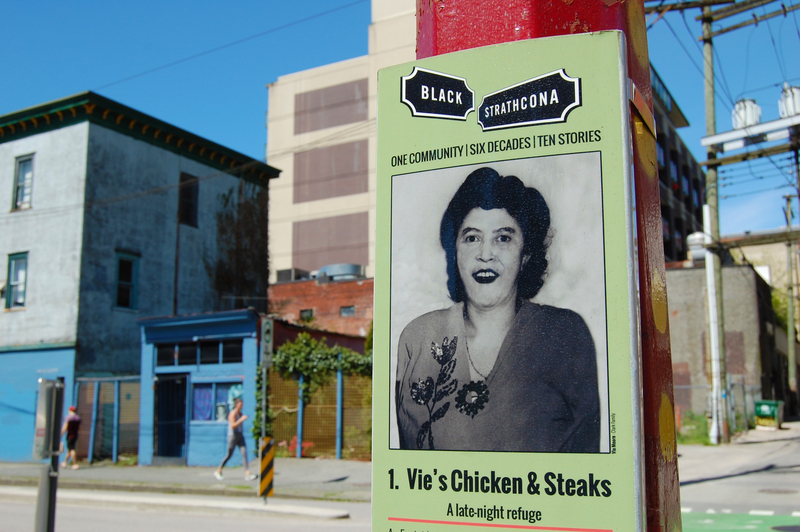 What started out several years ago with a single photograph from the CBC Vancouver Archives turned into another tale of Black Strathcona. This photo was recently published in the Sun to illustrate a story about PNG donating its historical photo collection to the City of Vancouver Archives. It shows the 200 block of East Georgia and shows the neon sign for Sarah’s Cafe! Sarah Cassell cooking in the kitchen at Sarah’s Cafe on Union Street ca. 1976. Photo: Peter Hulbert, Province Newspaper. I can’t believe it! After years of research I finally locate a photo of Sarah Cassell, thanks to the digitization of The Sun’s & Province newspaper archives available through Newspapers.com. When the Sun’s archives were made available last fall, I did a search for Sarah Cassell and her cafe with no luck. Since that time the Province newspaper archives have also been made available. By chance I did another search yesterday and lo and behold there she was in a 1976 feature in the Province newspaper. Following her death in 1990, the Province did another story about Sarah or “Mom” as some of her customers called her. I will have to update my story of Sarah’s Cafe. More to come soon. As a young Black Male 16 years of age. I lived across the street from Sarah’s cafe at 209 Union St. A grandson of Vie Moore, and brother of Randy Clark I would walk across the street to visit and talk with Sarah. She would talk to me while fixing hamburger and fries (chips) as she called them. Sarah was a wealth of Information I appreciated and needed as a young Black male new to Canada and the Community. Our family relocated to Vancouver from San Francisco, California the summer of 1965. I always remember Sarah for the advice she offered. Sarah has remained in my memory to this day. When my family reminisces about Hogans Alley we Always talk about Sarah’s. Thank you so much, Albert, for sharing your experiences with Sarah Cassell and her cafe. It sounds like she really made an impression on you (and your whole Family), and helped you when you were a newcomer to this city – an experience she would have been very familiar with herself. Stories like yours and Randy’s make me wish even more that I had the chance to have known Sarah. I’m just glad I had the opportunity to know about her just a tiny bit through her story told so many years later. If only we were able to go back in time, even if just for a moment. Christine, this is just a splendid piece of historical research. I was fascinated. Sarah Cassell was part of the fabric of Vancouver and her neighbourhood, and that makes her important. Yes, I knew about that. But those records are all the way in Victoria and I didn’t think they would contain relevant information for my post. Perhaps if I delve deeper, I will take a look. My father , Sam Bass, owned the first London Drugs Store at the corner of Main & Union. I spend many an hour at Sarah’s Cafe. She was a warm and wonderful person. I would would be happy to share my child hood memories with you. That is fantastic. Thank you so much Maxine. If you don’t mind, I will contact you directly via email. Nice work and research here on this impressively deep dive into one of the businesses of the area. Well done. I’m sorry to hear of her passing . I used to work at Chow Bros Produce on 200 Block Union in the mid seventies and ate at Sarah’s Cafe regularly . Although I did not know her personally , she was a very nice lady and a great cook . For your research I believe David worked for the Post office as I saw him on occasion wearing his postal jacket . Also a lot of police officers ate there regularly ( probably retired now ) Great work ! Thanks for sharing your memories of Sarah’s Cafe, George. I do mention in the piece that David was later working at Canada Post. Are you are the same George Lee that I quote in the post? Ask the Wolfman boys of 3 Vets, (who were also expropriated and torn down, along with Sam Bass’s original London Drugs, on Main Street), about their memories of the neighbourhood. Thanks Bill, that is a good tip! Wonderful story – thanks for painting a picture of a bygone era, & how a single business owner can affect the lives of so many in a neighborhood. Heritage Vancouver re-posted this story on Facebook and I commented there, but thought I would share here as well. My Dad was on the Vancouver Police Force in the 70’s and often ate at this restaurant. I never visited myself, but while I was growing up, he shared fond memories of this quirky little establishment, He passed away a few years ago, but reading this story and learning more about the lady who owned it reminded me both of him and a vanished time in Vancouver and made me smile! Hi Shannon, thanks for your comment here and on Facebook (I just saw it). It is great to get these personal (even if second hand) stories about people going to Sarah’s cafe, as well as their impressions of her as a person. It seems that a lot of the VPD went to Sarah’s Cafe regularly, it’s so cool that your Dad was one of them. I love the in-depth digging you did on this story – and the photos were wonderful. Perhaps folks who remember this establishment (or Sarah’s relatives) will come across this article and post more photos of the restaurant or even Sarah herself! Thanks so much! Yes, that is what I hope happens! Hi. In the late 50’s i remember buying pies from Sarah’s cafe. I had a paper route in the area, and on collection day i had lots of tips and one of the treats was getting pie from Sarah. A lovely lady. Mr. Tosi located on main street also has remembrances of her. great research you have done. i hope you find a good picture of the storefront. Perhaps in the vancouver archives. I think she had a large sign with a Pepsi logo on it. Thanks for your comment about your experiences with Sarah and her Cafe. You are the first person to mention pie! I will have to stop by Tosi’s soon and talk to Mr. Tosi about Sarah. I have checked all available local resources for images of Sarah’s Cafe… so far all I found is in the post. But, I will keep checking as new images are digitized and made available to view. From what I can tell she had a 7-Up sign, but perhaps she also had a Pepsi sign at one point. it could very well have been a 7-up sign, all i can recall was that it was right angle to the entrance. Yes, Sarah did sell pies. For us kids, it was the Hamburgers (they were quite big and finger licking good) and fries. I remember Sarah opening the restaurant, to start the day, entering from the front door of the restaurant on Union St. (across from our house at 230 Union St.). How convenient it was for us to get our fill (satisfied!) right after school and almost any time during the summer. I also recall seeing her son (David) many times entering the restaurant. For the most part Sarah’s was a one person operation. I believed the restaurant would close around 5 pm. Definitely before Vie’s opened. We knew Sarah had an ‘accent’ thinking she was from the Caribbean but not knowing which Island or Country. Never heard her complain about how difficult the restaurant business was. I do recall her laughter, the front sign, and music playing inside her establishment. ps Angelo at Tosi’s remembers Sarah well. Thanks for your comments, Randy. It is great to hear more about Sarah from those who actually knew her. I really would have liked to have met her and had some of her fries! I guess I should stop by Tosi’s soon! You may want to stop by Tosi’s sooner than later. Not sure how much longer Angelo will be able to keep the store front business open. Every time I enter his place it is like travelling back into he past. I still remember his parents (especially his Mother fully covered in clothes with her dress almost touching the floor). Very old Italian style. Many large barrels of olives and large pickles (my sisters favourites!). I recall the 3 Vet’s. They were friends of my Grandparents. We (my Brothers and I) were allowed to run through the store whenever we wanted (at least it seemed that way). Bill was the only name of the three owners I have always remembered. In 2007-8 I was introduced to the then current owner of the 3 Vet’s. I was Principal at Point Grey Secondary and his daughter attended the school. I asked if he could tell me whever happened to the original owners who were so kind to our Family when we first arrived, as kids, from San Francisco in 1965. I said the only name I could remember was ‘Bill’. The parent said to me ‘Bill was my Dad!’ We hugged each other right there in the main office. That’s when I first heard ‘Wolfman’was there last name. A community with so many nice people! Thanks again, Randy! I’ll take your advice about visiting Angelo sooner rather than later. I know every time I head down to that area I’m surprised he is still open. You are so right, it is exactly like stepping back in time every time you enter that place. While I was researching the piece about Sarah, I learned a lot about the history of the area… too much to include in the article… including the start of the 3 Vets. Your story about meeting the daughter of one of the current (or then current) owners at Point Grey made me smile. I attended Point Grey High School in the 1980s; well before your time, I know. In fact, while I was there Mr. Minichiello (of the Minichiello family who lived in Strathcona in the early days)… this reminds me that in many ways Vancouver (especially for those of us who have been here a few years) is still quite a small place. Thank you so much for sharing your experiences! I thoroughly enjoyed following the string of comments regarding Sarah Cassell. My family lived across the street from Sarah at 250 Union Street from 1953 to December,1969 when we had to move due to the expropriation of the entire block to build the Georgia Viaduct. She had the biggest laugh, was always so kind, she knew everyone on the block. We were all poor back then, so we would pool our pennies together and Fifteen cents would get you a huge bag of “chips”. She would fill the bag to the brim for us, we would sit right down on the curb & share the chips while she stood outside her door talking to us. She’d ask us about school and how our families were doing. All the kids loved her & she loved them. Vie’s was down the street, however, I never ate there until the early seventies when I could be out late at night & could afford it. By then Mrs. Clark (Vie’s daughter-in-law), Randy & Albert’s Mom had taken over the restaurant. Our block was probably the safest block in the entire city during those years. There was always policeman parking & walking up & down the street to go eat at Sarah’s in the day time and Vie’s at night. I seem to recall that Vie’s use to stay open until 3:00 or 4:00 a.m. I also remember Sam Bass, of London Drugs at the corner of Main & Union. He knew all of us kids and would give us a full size candy bar when we went trick or treating at Halloween. That was a big deal and meant a lot to us. H.Y. Louie Company warehouse was either next door or 2 doors down from Sarah’s. The 4 brothers were also very kind to us kids. Whenever something happened to a box that say got crushed which would render it unsaleable i.e. Pop Tarts or other products they would bring out the box, open it up and pass out the undamaged packages to us kids. Very special times growing up then with many great memories of “Our Block”. Thank you Lana. I’m glad you enjoyed this post. Thank you so much for sharing your memories of “your block” and your experiences with Sarah. The more I learn about her the more I wish I could have met her. Oops! Mrs. Clark is actually Vie’s daughter not daughter-in-law. There was also a coffee shop that I can’t remember the name of at the northeast corner of Main & Union, which is still there.